FILM AS LITERATURE Tuesday, April 17, 2012. 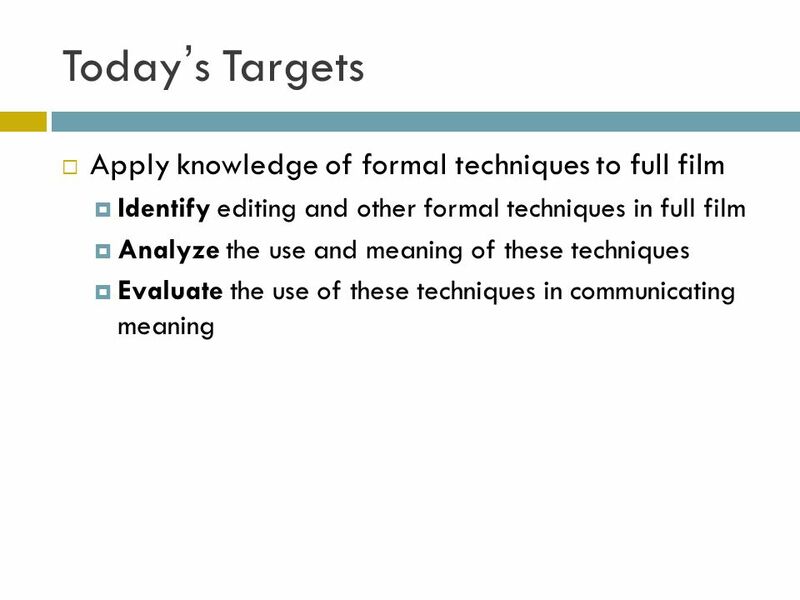 Todays Targets Apply knowledge of formal techniques to full film Identify editing and other formal techniques. 8 Example Truly good films are works or art that blend form and rich images with intriguing content. Director Alfred Hitchcock is such an artist and Rear Window is one of the masterpieces in his collection. 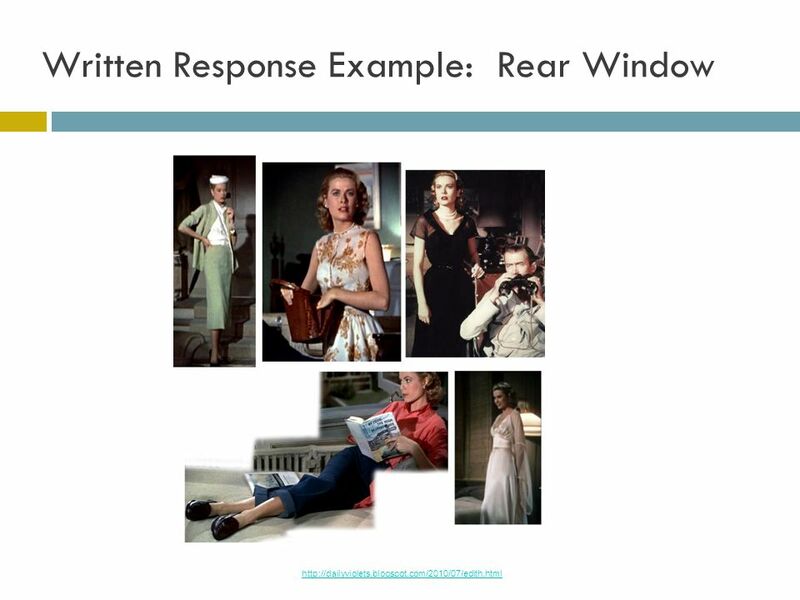 In Hitchcock's Rear Window, the most round or dynamic character is Lisa, whose transformation from a socialite to detective is masterfully shown not only through her actions but also through the costume designs of Edith Head. For example, when Lisa first floats in to Jeff's apartment, she is twirls in her outrageously expensive black and white gown that doesn't entirely fit through the doorway. Not only is the outrageous price of the gown a reflection of Lisa's high status, the design itself reflects the idea that its only practical purpose could be dancing through crowds or schmoozing the elite over sips of champagne. This is a stark contrast to the adventurous life led by Jeff. Jeff even explicitly states that Lisa, as she is in such a dress, wouldn't last tromping across Africa or crawling through mud. However, by the end of the movie, Lisa and her clothes are a drastic contrast to this first image of her. In the final shot of Lisa sprawled along Jeff's window seat, Lisa, for the first time no longer wears heels. Instead, she is dressed in simple loafers, a button- up cotton shirt, and jeans. This shift in garb reflects the change that Lisa has undergone. Gone are the flowing and frilled dresses, the heals, and the crinoline shawls. The pants and shoes become a symbol for Lisa's more relaxed style and more adventurous spirit, the type of personality that could fit in well with Jeff's traveling life. It is with these visual cues that Hitchcock, assisted by the costume designs of Edith Head, clues audiences in to the implicit message that Lisa is a changed woman. At least somewhat. 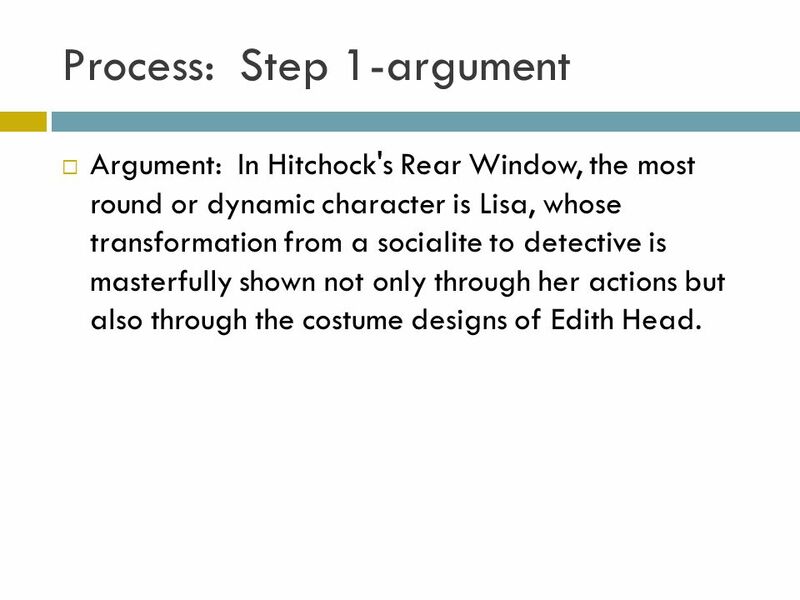 9 Process: Step 1-argument Argument: In Hitchock's Rear Window, the most round or dynamic character is Lisa, whose transformation from a socialite to detective is masterfully shown not only through her actions but also through the costume designs of Edith Head. 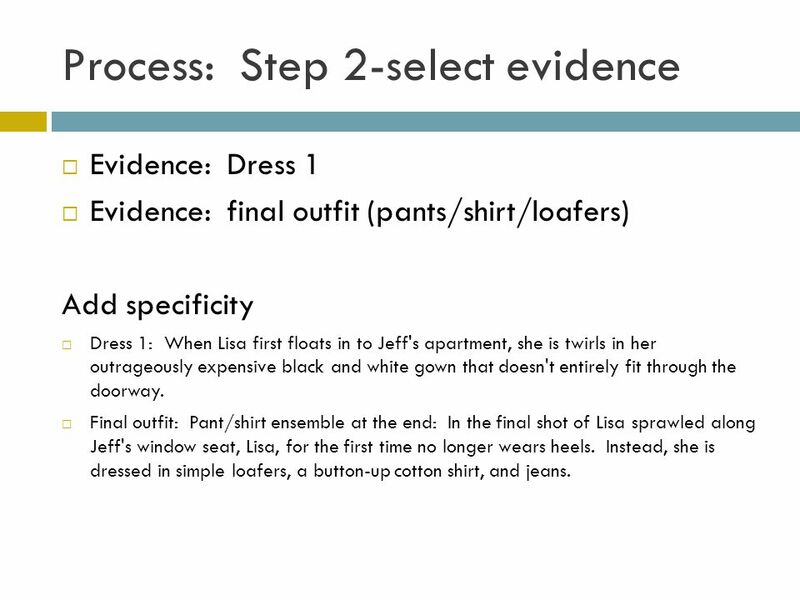 10 Process: Step 2-select evidence Evidence: Dress 1 Evidence: final outfit (pants/shirt/loafers) Add specificity Dress 1: When Lisa first floats in to Jeff's apartment, she is twirls in her outrageously expensive black and white gown that doesn't entirely fit through the doorway. Final outfit: Pant/shirt ensemble at the end: In the final shot of Lisa sprawled along Jeff's window seat, Lisa, for the first time no longer wears heels. Instead, she is dressed in simple loafers, a button-up cotton shirt, and jeans. 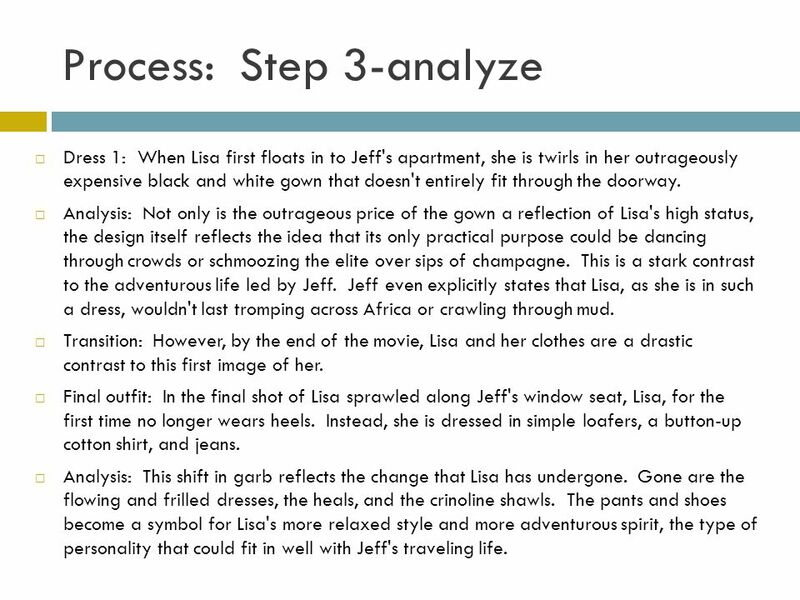 11 Process: Step 3-analyze Dress 1: When Lisa first floats in to Jeff's apartment, she is twirls in her outrageously expensive black and white gown that doesn't entirely fit through the doorway. Analysis: Not only is the outrageous price of the gown a reflection of Lisa's high status, the design itself reflects the idea that its only practical purpose could be dancing through crowds or schmoozing the elite over sips of champagne. This is a stark contrast to the adventurous life led by Jeff. Jeff even explicitly states that Lisa, as she is in such a dress, wouldn't last tromping across Africa or crawling through mud. Transition: However, by the end of the movie, Lisa and her clothes are a drastic contrast to this first image of her. Final outfit: In the final shot of Lisa sprawled along Jeff's window seat, Lisa, for the first time no longer wears heels. Instead, she is dressed in simple loafers, a button-up cotton shirt, and jeans. Analysis: This shift in garb reflects the change that Lisa has undergone. Gone are the flowing and frilled dresses, the heals, and the crinoline shawls. The pants and shoes become a symbol for Lisa's more relaxed style and more adventurous spirit, the type of personality that could fit in well with Jeff's traveling life. 12 Process: Step 4-opening and closing Opening: Truly good films are works or art that blend form and rich images with intriguing content. Director Alfred Hitchcock is such an artist and Rear Window is one of the masterpieces in his collection. 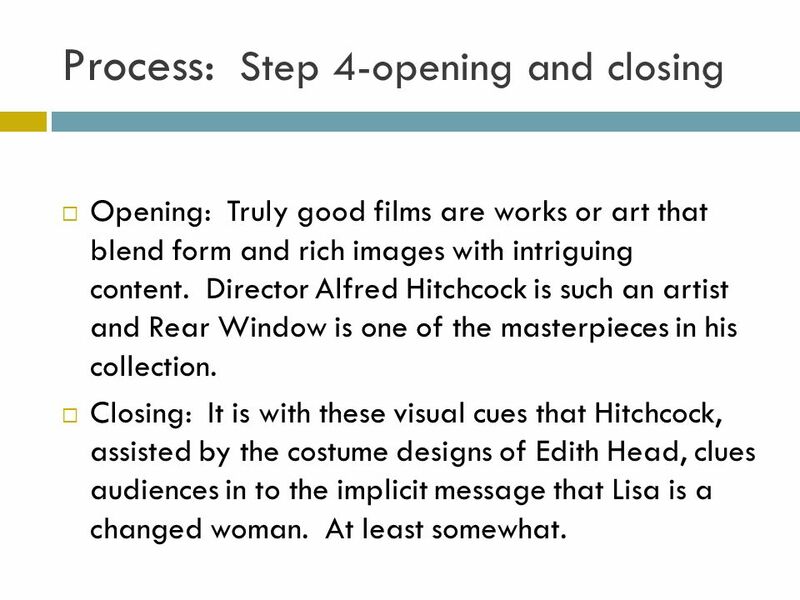 Closing: It is with these visual cues that Hitchcock, assisted by the costume designs of Edith Head, clues audiences in to the implicit message that Lisa is a changed woman. At least somewhat. 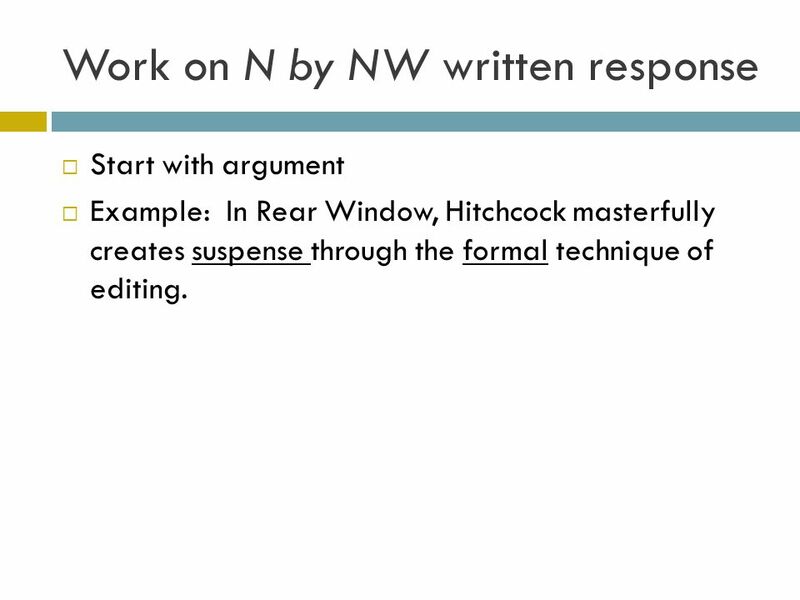 16 Work on N by NW written response Start with argument Example: In Rear Window, Hitchcock masterfully creates suspense through the formal technique of editing. 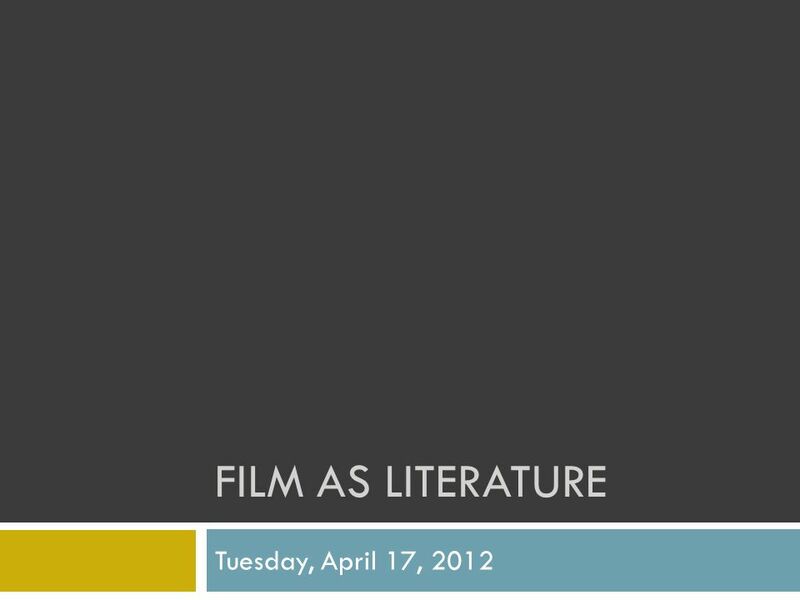 Download ppt "FILM AS LITERATURE Tuesday, April 17, 2012. Todays Targets Apply knowledge of formal techniques to full film Identify editing and other formal techniques." 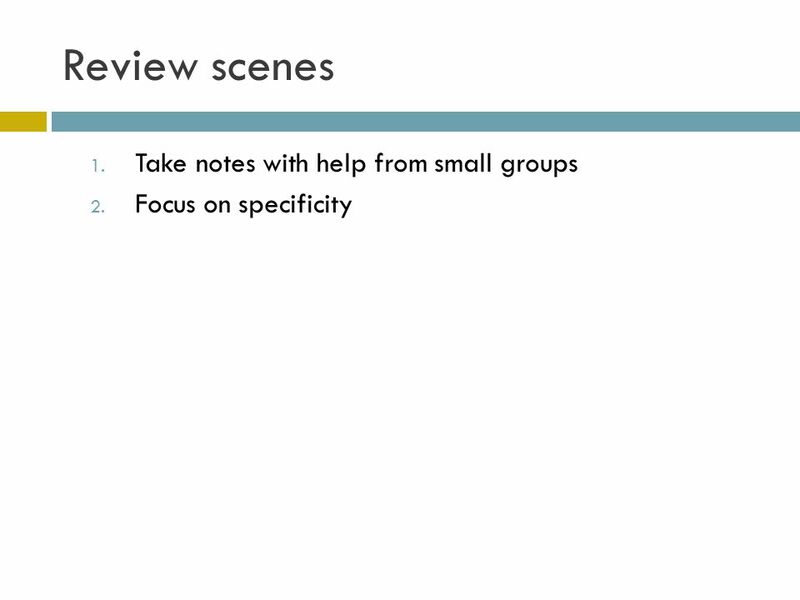 11/4/2013 Planning a film Video Production. 11/4/2013 Idea Concept Storyboard. BEYONCÉ If I Were A Boy. 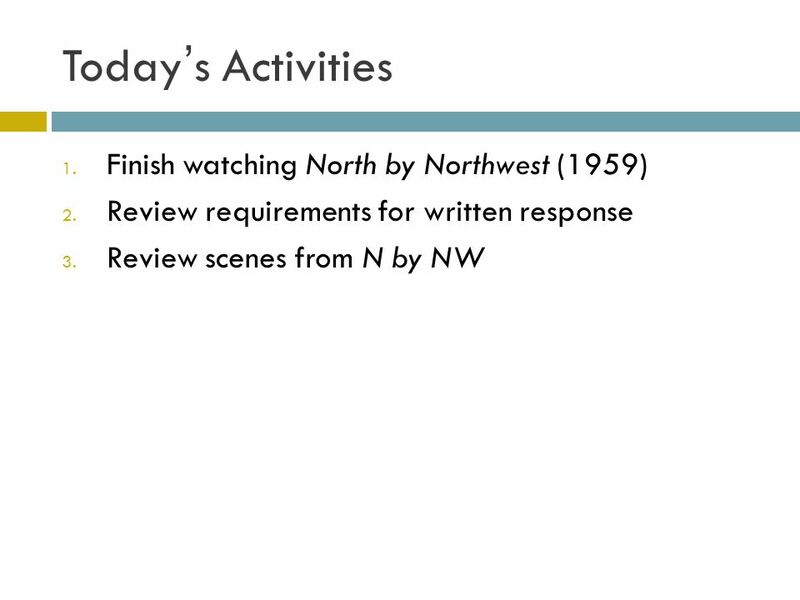 FILM AS LITERATURE Thursday, April 12, Todays Targets Apply knowledge of editing, composition, camera angle, etc. techniques to full film Identify. Camera Shot – single, continuous view taken by a camera, from the time the camera starts recording to the time it stops. 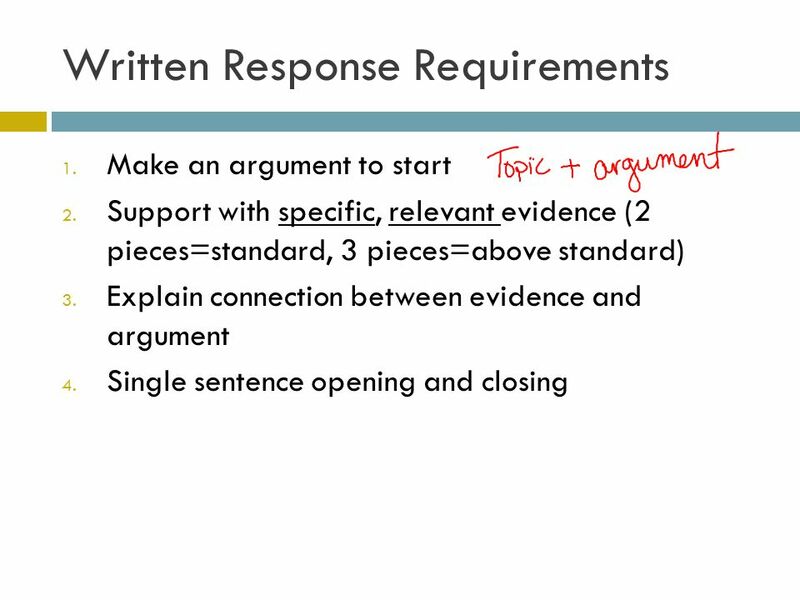 No Entry Task: just get out your journal, and writing utensil, and then be prepared to start immediately. “Entry Task” 1/6/15. 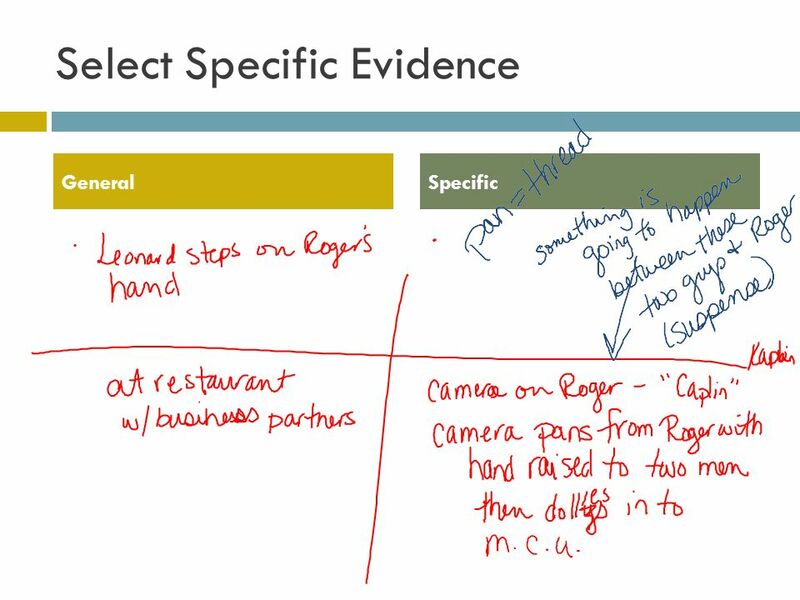 SpringBoard 2.21 Objective: I will analyze scenes in order to conduct character analysis based on context clues within the images. 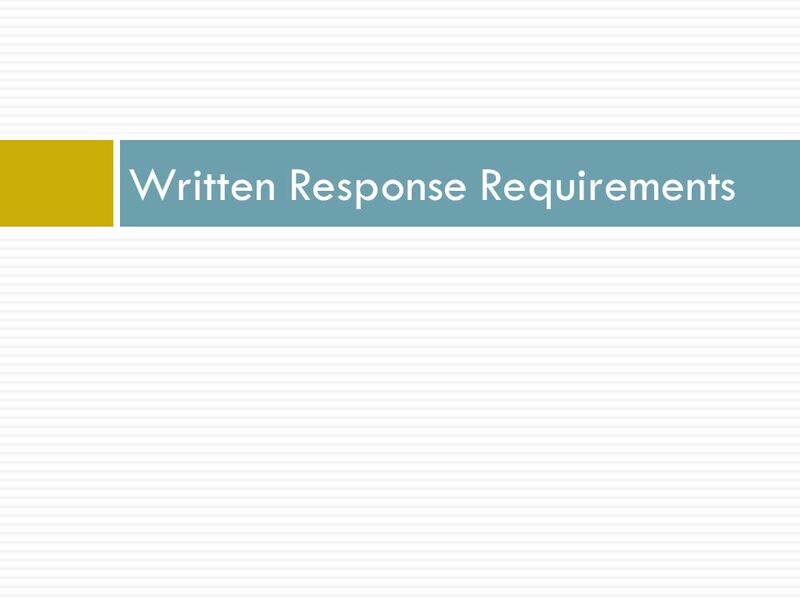 You will need the following. Speaking Activity Cueing Game What do you wear today? What is your favorite outfit? 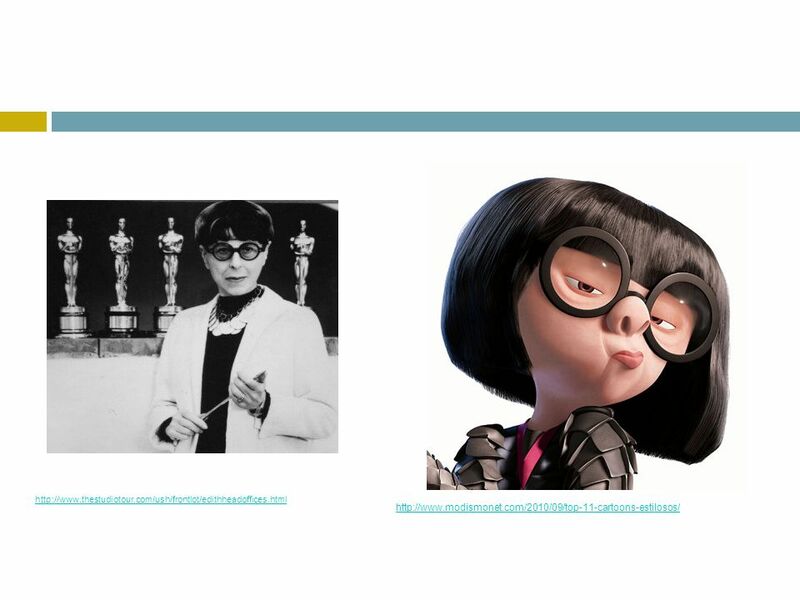 2.12 Cinematic Techniques Film can be analyzed by understanding both literary elements and cinematic techniques that create effects for the audience. To. 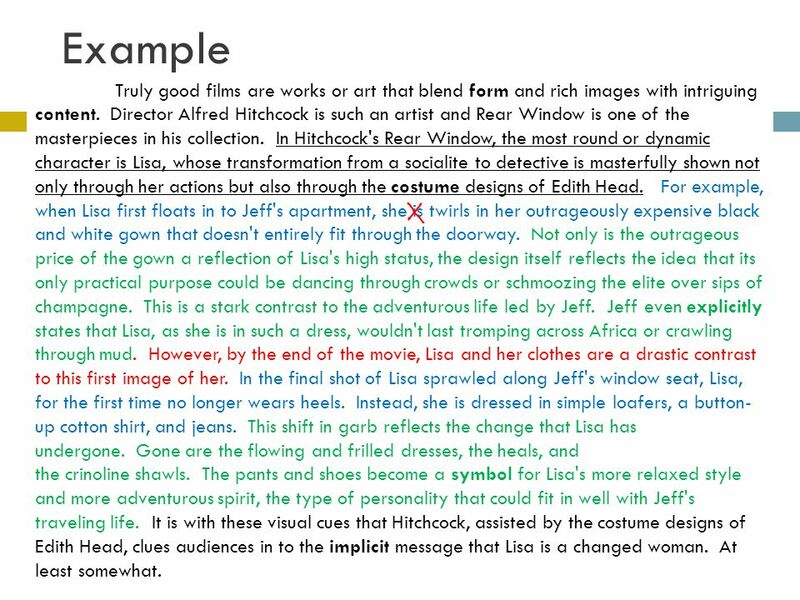 Text Analysis. We “read” much more than just books and short stories. Everything we look at, watch, and observe, we are interpreting. 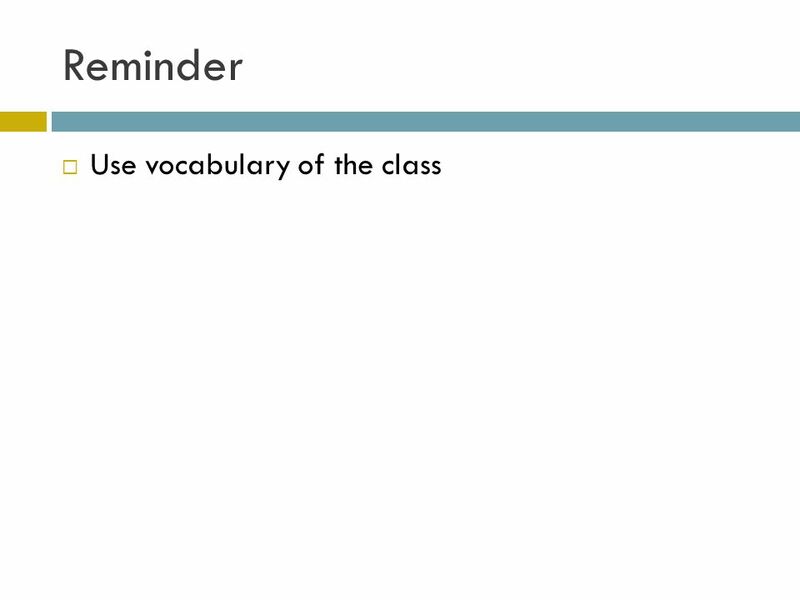 This assignment. Viewing Films Actively Paige Mayhew Oklahoma Writing Project “Thinking is skilled work. It is not true that we are naturally endowed with the ability. Objective: 1. Learn to analyze critically Music Videos and understand how they are produced. 2. Create a music video based upon a visual artist, and use. 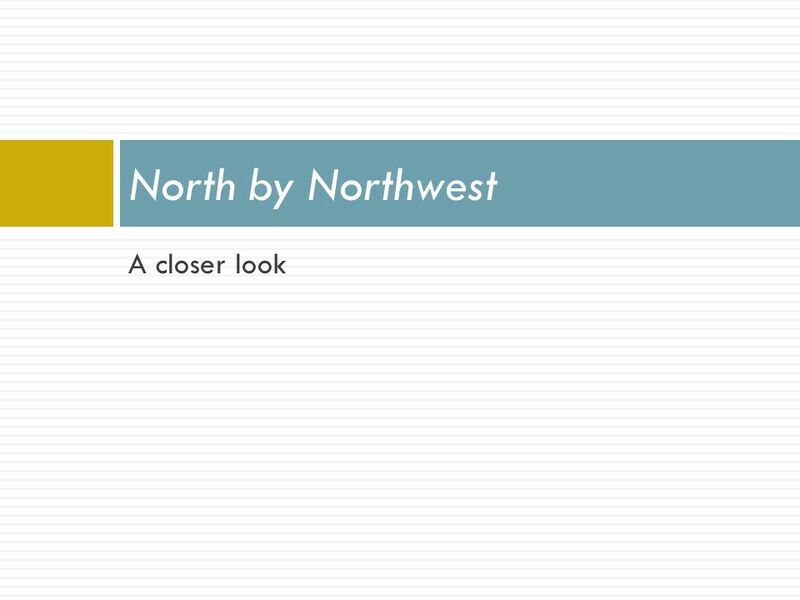  The location for this film is on a train that is making its way through the countryside toward a city; Chicago.  The lighting of this sequence is very.